Image caption: an activist with a megaphone leads a large group of protesters marching down the streets. Banners reading “I.C.E. is rounding people up in a sanctuary city. I.C.E. GET OUT” and “No más deportaciones!” are visible. The following are pictures from the Philly ICE office occupation, taken between 5:30PM and midnight on July 2, 2018. They are followed by an Occupy ICE Press Release from July 3rd. More than a dozen police officers with bicycles guard the ICE office. One glares at the camera. More than a dozen police officers with bicycles guard the ICE office. Protesters stare down several police officers with bicycles standing in front of a police SUV. Dozens of protesters line up in front of ICE garage doors; to the left we can see their tents. 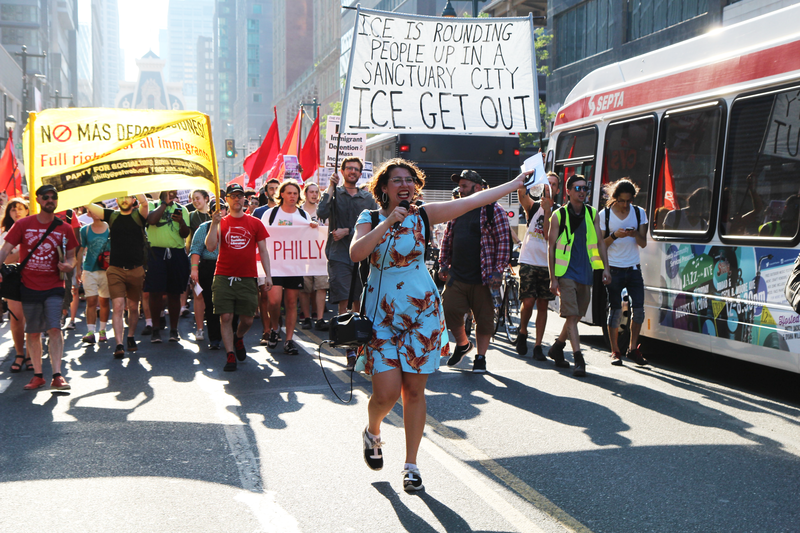 WHERE: 114 N. 8th St.
PHILADELPHIA, PA, July 3– After a broad coalition of Philadelphia socialist and progressive organizations blockaded Philadelphia ICE offices for over 18 hours, Philadelphia police attempted to clear the encampment and arrested between 10 and 30 pro-sanctuary activists. Remaining occupiers voted to stay. The occupation intends to impede the work of the ICE facility and to inspire Philadelphians to join the action. The occupation is an extension of the series of similar actions which have taken place around the country, demonstrating that there is a popular rejection of ICE, and that its continued existence is political nonviable. Protesters rally in support of undocumented immigrants and their families, demanding not only the end of family separation, but an end to deportation, detention, and the institution of ICE itself. Mass public outrage has forced Trump to withdraw his policy of separating children from families in detention facilities. We applaud this swell of activity, but it is not enough. Trump’s small concession leaves the infrastructure for detention and deportation fully intact. Trump can easily wait for the outrage to subside, then subtly pass less inflammatory but equally damaging legislation while the public isn’t looking. We must take concrete steps forward, not merely defend the status quo. Immigration has effectively been criminalized – that’s how far back we’ve been set. It should not be a crime to flee poverty and violence, especially since that poverty and violence is often the result of U.S. intervention in Central and South American countries. We have concrete demands on the city and state to terminate cooperation with ICE. ICE has access to PARS, a legal database used by the city. This contract ends on 8/31, and we demand that Mayor Kenney cancel it. The Berks County Family Detention Center, located outside of Philadelphia, is one of three family detention centers in the country, and the only one that can hold families indefinitely. We demand Gov. Wolf order the closure of Berks. Families must be guaranteed legal status and an option of high quality public housing in-state, NOT be transferred to another facility upon closure. On a larger scale, we demand the defunding and dismantling of ICE. ICE, responsible for family separation and for raids of homes and workplaces, is also an economic weapon on working people, used to drive down wages and working conditions of immigrants (as well as the broader working class). Ending the criminalization of immigrants is a crucial part of the fight to secure true safety and security for all working people—a fight which includes affordable housing, a living wage, quality public education, and a massive public jobs project. Previous Occupy ICE Day 2: Come Support!